Trapa bispinosa is the botanical name and singhara is hindi name for this Indian water chestnut . It is an aquatic plant and bears a fruit which has a tough skin protecting a soft white flesh . The white flesh becomes harder when the fruit is mature. The tender and mature fruits both are tasty in their own right and if cooked differently. Tender fruits can be eaten raw and are very good for snacking , peeling the hard skins and eating the white fleshy nut is a yummy time pass. Apologies for a shady picture :) will try and upload a clear picture soon. These are small singharas , some of them are tender and some mature. The mature singharas are boiled along with their skins and then peeled and the hardened white flesh has a very nice nutty flavor . This can be used for dressed salads or just as a standalone snack . In some parts of India this boiled singhara is a common street food served with a dry green chutny . What i did here is just microwave the peeled fruit with salt and pepper . 2 minutes covered for 250 gms of singhara . That's it . It's ready for a snack attack or a meal , whatever way you like them . Alternatively , they can be stir fried in very little ghee with salt n pepper till lightly pink . They cook very fast if they are tender and may take about 5 minutes if mature. You would like them both ways if you like the flavor and aroma of singhara . They have a nice aroma when cooked . That lovely aroma is more pronounced if they are cooked into a halwa. Usually the powdered flour of dried singhara nuts is used to make halwa ( recipe some other time ) but i like it made with fresh raw singhara . This was an experiment i did when i was a teenager and everybody in the family loved it . I never made a halwa from singhare ka atta ( singhara flour ) after that . 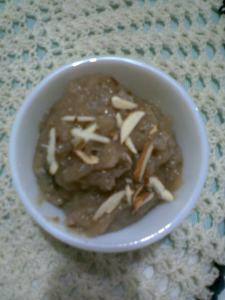 I have a few pictures of the halwa cooked last year . Pictures were taken by my cell phone camera , so they are a bit blurry but the recipe is simple. Grind the raw peeled singhara in a mixie to make a smooth paste . 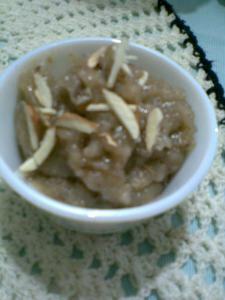 Tender singhara is more suited for this halwa , though it is good with mature fruits as well. Heat a tbsp of ghee for each cup of singhara paste , pour in the singhara paste and fry till the paste becomes translucent . It may take 2 minutes for a cup of singhara paste. Add 1 tbsp or a bit more sugar ( according to taste ) per cup of paste and stir for a minute . It's done and serve hot with chopped nuts as a garnish . We do not like any cardamom in this halwa as the aroma of raw singhara is so very tempting . You would fall in love with this fruit with two horns ..... hence bispinosa is the second name in latin following the binomial nomenclature . this is new to me, I havent heard abt it..
Hey hw quick and good a snack it is...n tat halwa looks soo scrumptious. But they make the halwa out of singhara ka atta too right.... My Sis in-law made it for me this time I went there & Maa in-law makes it for me always when I am there... I simply love the taste...... very divine..... WOW!!!!! I love to eat Singaras, never tried to cook it though. Shall do it. Looks great sangeeta and I am sure tastes as good.Btw..I do have steamed ripe plantain and puttu recipes..you can check out in snacks,sweets and in breakfast recipe index. I ahve never tried this sounds delicious - your blog is ver nice too. like to know how much carb in singhara?